3 What does Team Frednet want to achieve? Team FREDNET is an official competitor for the Google Lunar X PRIZE. The purpose of this competition is to place a privately funded robotic explorer craft on the surface of the Moon. The explorer must also satisfy certain requirements specified by the X PRIZE Foundation and provided in more detail on the requirements link included below. Briefly, those requirements include the transmission of near-real-time high-definition video from the Lunar surface to our receiving station on Earth, while traveling at least 500m along an interesting and controlled path. The X PRIZE Foundation also offers a bonus prize for exploring over an additional 5000m (5km), and another bonus prize for surviving the intense cold of a Lunar night then continuing to explore the Moon's surface after the Sun rises again. The grand prize of US$20M (US$20,000,000.00 or US$20.000.000,00) is open to officially registered teams to win up until the initial deadline of 2012/12/31. This prize amount is reduced if no team has completed the mission by that time, and the prize becomes US$5M (US$5,000,000.00 or US$5.000.000,00) awarded to the team that completes the mission after 2008/12/31 but before the contest termination date of 2014/12/31. See the detailed rules provided in the link below for more information about the other prize amounts (second place, bonuses, partial completion prizes, etc.). Team FREDNET is a working Open Source Community, comprising members from six continents and dozens of countries around the world. The Team is open for participation from anyone, including people in both technical and non-technical roles, business, marketing, sales, production, creative, analytical, educational, and much more. Our mission requires us all to work together cooperatively and to incorporate many interdisciplinary skills. This collaborative interdisciplinary approach shall be the seed of our success. The Team was founded by Fred Bourgeois (Fred.Bourgeois@TeamFREDNET.org) and was one of the first 2 teams to publicly announce their intent to compete for the prize. Team FREDNET rapidly grew from a handful of developers (12) in September 2007, to more than 500 members today. That growth is a witness of the incredible amount of interest in returning to the Moon, from dedicated people all around our world. We are a new generation, with a new purpose, asking not what our planet can do for us, but what we can do for our planet. What does Team Frednet want to achieve? Also, although we did not initially set out to do so, we believe we are best positioned to win the Google Lunar X PRIZE "Diversity Bonus Prize". Some of our competitors have already suggested that that prize be awarded to Team FREDNET. Our position is that diversity means that we are really all the same, because there are only two colors that matter on Team FREDNET: our brains are all Gray, and our blood is all Red. While our members span the gamut of ages (age 8 - 80+), as an organization we are still young. Our members have a variety of levels of education, experience, and background. Many open questions and a great deal of work remains to be done. But we are learning fast, dedicated to complete the tasks at hand, and working hard, with an amazing and unprecedented level of International Open cooperation for a Space mission. increasing our rovers probability of survival in the Moon's difficult environment. Many components of the designs will therefore be modular and interchangeable. These component modules include the electronic and software controls at the heart of the systems, as well as both the still and video imagery systems. Some requirements specified by the X PRIZE Foundation are not very exact (e.g. "framerate", "near realtime video"). By our best estimates, the image and video technology offered by Elphel is more advanced than the minimum requirements, and therefore provides a good solution that allows us to meet these requirements. Please note, however, that the specific rules provided by the X PRIZE Foundation are still subject to (hopefully now minor) revisions. If possible, Team FREDNET plans to exceeed the minimum requirements. E.g. we plan to provide 5Mpixel images, higher framerates (15fps, 29fps, ...), and more where this is technologically feasible without significantly impacting the budget for the overall Mission. Team FREDNET will develop a casing for the camera and sensor unit which provides sufficient protection against these risks. We currently have two different schematics for the data processing system of the Rover. To minimize mass, size, and power consumption, we prefer the first design, but remain flexible. 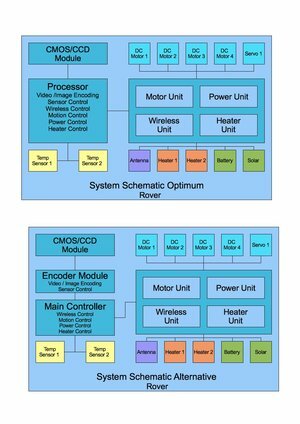 The main difference between the two schematics is that in the first all data processing (including encoding of the incoming video and images from the CCD/CMOS Sensor) is done by one processor, while in the second multiple processors are utilized. Note that depending on the rover design, there may be other changes, such as utilization of 2 or 4 motors, or utilization of a single heating system. The data storage device is not yet specified, and depends on the availability of space-hardened high capacity solid state data storage devices that meet the (as yet undetermined) requirements for buffering and caching of streaming video, imagery, telemetry, and other required data. Inclusion in the Partners section of the [new] Team FREDNET web site. Potential to enter into Sponsor agreements under which the Elphel name and logo are "faded in" to streaming video broadcasts from the surface of the Moon. Potential to Sponsor other Media and Press Events, and to participate in Team Summits and Developer Conferences. Additionally, Elphel gains a wide audience of knowledgable and experienced hardware and software developers from around the world. While we cannot guarantee that this will lead to an increase in use of Elphel solutions, empirical evidence suggests that developers who have been given access to such systems tend to later re-use and specify systems with which they are familiar to their clients, employers, and interested third-parties. Further, inclusion and frequent mention in a high-profile and exciting proposition such as this will automatically generate higher placement in search results on the numerous search engines. Being associated with a high profile project will tend to generate more highly placed results, leading to more interest from potential users of Elphel technology. This is only a very brief description of Team FREDNET and the current project status. Please visit our website, wiki, and forums to get a broader view of the activities currently in progress. This page was last modified on 1 February 2010, at 15:55.